Late in World War II, the Empire of Japan developed a new type of weapon. Very young pilots flew one-way missions in planes which often had no landing gear. One 17-year-old, Corporal Yukio Araki - who was holding a puppy the day before he flew a fatal mission on May 26, 1945 - was a member of 72nd Shinbu Squadron at Bansei, Kagoshima (on the home island of Kyushu). This clip, from a documentary of historical footage compiled by British Pathé, takes us to the scene of kamikaze battles. In unbelievable scenes, with flak surrounding the planes, these suicidal missions took a heavy toll on both sides of the fighting. The American carrier, USS Essex (CV-9), was attacked on November 25, 1944, when a kamikaze (Lt. Yoshinori Yamaguchi) exploded his plane (a Yokosuka D4Y) at midship. The carrier survived the attack. The USS Bismarck Sea (CVE-95) - participating in the battle for Iwo Jima - was not so fortunate. Following two direct hits, inflicted by two kamikazes, she exploded and sank on the 21st of February, 1945. 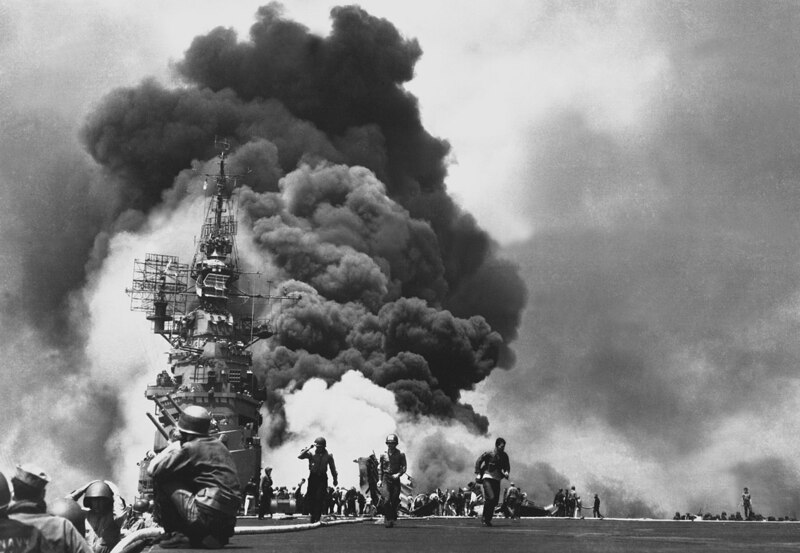 ** Nearby, the USS Saratoga (CV-3) sustained damage from another kamikaze attack on the same day. 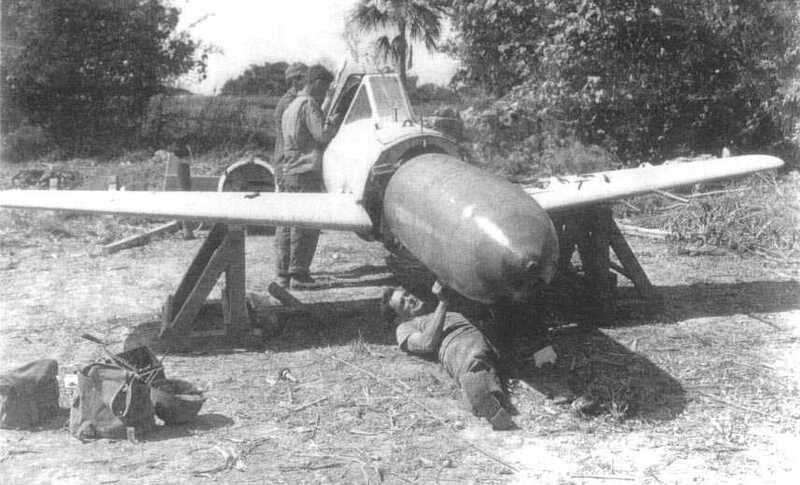 The Thunder Gods were a Japanese naval-aviation unit trained for one-way missions in flying bombs called the Ohka, which were launched from a mother-plane. Employed mostly in the 1945 Okinawa campaign, they sank one U.S. destroyer at a cost of 438 pilots and crew members. The author, who took part in the wind-tunnel testing of the Ohka , describes the flying bomb's conception, development and the training of the pilots. Volunteers were categorized as Compliant, Eager, Very Eager and - if they signed their application in blood - Earnest. Missions are described from the mother-plane crew's point of view or by Ohka pilots who were not launched at the target for one reason or another. More fully than in other recent books on kamikazes, Naito explains the spiritual dimension of the kamikaze phenomenon and its complicated effect on individual pilots. This clip tells us that 3,500 planes - flown by kamikaze pilots - were lost in just two months. When the USS Bunker Hill (CV-17) was attacked by two kamikaze pilots - one of whom was Ensign Kiyoshi Ogawa - the crew saved the ship by making drastic maneuvers. Clip from documentary, online courtesy British Pathé, copyright British Pathé, all rights reserved. Clip provided here as fair use for educational purposes. ...sunset had occurred at 1825 [6:30 PM, local time] and only half light remained. Approximately three planes were seen headed toward the LUNGA POINT [CVE-94] which was on our port bow, somewhat more toward the port beam. Our battery two took one of these planes and splashed it. A few seconds thereafter a plane was observed very low on the water just outside of one of the screening destroyers on our starboard hand, the destroyer being between the plane and ourselves. The destroyer, which was a part of the screen and other vessels of the screen, did not open fire on this plane because the word had been passed that there were friendly planes, namely the SARATOGA planes in the area and due to the half light they could not be clearly distinguished from enemy planes. This plane which was coming in low continued toward the destroyer, which was approximately a thousand yards on our beam and just as he got there, that is just as he got to the destroyer, he dodged around her stern and came directrly for us. Some of our guns couldn't fire because they would have been firing directly at the destroyer. Others had just enough room to open up and begin hitting the plane, but they did not have sufficient time to shoot as the distance covered by him from the time he left the destroyer until he got to us was a matter of three or four seconds. This plane struck the ship abeam of the after elevator and entered the ship between the water line and the flight deck. When it entered the side it knocked four of our torpedoes from the starboard rack where they were stowed ans scattered them about the hanger deck. The elevator cables were parted and the elevator fell to the bottom of its well. The after fire main was damaged and no water was available at the scene of the fire. The water curtains were immediately turned on, but due to the damage to the fire main, which I have mentioned, the water curtain in the vicinity of the after elevator had no supply and did not function. This started a considerable fire and the regular party on the hanger deck and all hands who were available came aft to fight the fire. The glow undoubtedly showed clearly through the open elevator well and attracted a second enemy plane which came in vertically from directly overhead and struck the flight deck just forward of the elevator well. This killed or mortally injured all of the fire fighting party and wiped out the repair three party whose station was directly below the area of the fire. The explosion caused by this second plane also buckled the bulkheads in the gallery spaces over the hanger deck and collapsed or disrupted some of the decks in the 20 and 40 mm. clipping rooms and a large quantity of 20 and 40 mm. ammunition, which was stored there, fell into the fire. ...at seven o'clock or 1900, passed the word for all hands to go to their abandon ship stations because I expected the torpedoes, which were directly in an intense fire and could not be reached, I expected them to explode at any time. To go back a little bit, I believe about 125 were killed in the explosions that occurred aboard ship before we left. The ship had about 2½ knots headway on which was fortunate because it assisted the personnel in getting clear. Even so, just as we left a tremendous explosion occurred which was undoubtedly one or more of the torpedoes. This explosion blew the aft part of the flight deck off and blew the sides off the ship aft of a point about half way down the flight deck. I was just leaving when this explosion occurred and the ship rocked tremendously and the noise was deafening. This explosion undoubtedly did some damage below because the ship began to list immediately and listed slowly for about twenty or thirty minutes and then rolled over completely. She sank about 2100, very slowly and without much commotion. Bos, Carole "Kamikaze Attacks - Pacific Theater, WWII" AwesomeStories.com. Oct 07, 2013. Apr 24, 2019.